Lee and Daisy Poole will be climbing Mount Snowdon at midnight. A father and daughter duo from Ludborough are tackling the task of climbing up Mount Snowdon - but unlike most will set off on their trek at midnight. Dad Lee Poole (47) and daughter Daisy (22), will be making the 1,085 metre ascent to the top of the mountain in Wales on August 5. 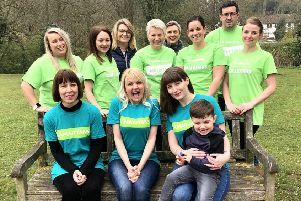 The hike, organised by Macmillan Cancer Support, will see 500 supporters from up and down the country taking on the challenge, all on the same day. Having ‘braved the shave’ for Macmillan last year, Lee was looking for a new challenge to help raise funds for a local charity that undertakes vital work. “Daisy and I have been training each weekend in the Wolds in preparation for the climb,” Lee said. Mr Poole added that he and has daughter have walked through mud, sand and water, as well as running up hills all over Lincolnshire for the last four months. “We are passionate about raising money for Macmillan Cancer Support,” Lee told the Leader. Lee and Daisy want to not only raise as much as they can for this cause, but to also raise awareness of the work that Macmillan does in the local community and how it helps people. You can support Lee and Daisy by visiting https://www.justgiving.com/fundraising/Lee-Poole-MrDynamic.